Eye candy. The Lenovo IdeaPad U400 features one of the better-looking exteriors we've seen on a mid-range notebook, but can its internal components match up? Mainstream consumer laptops come in all sorts of shapes and sizes, but one thing usually remains consistent: users will have to deal with some compromises, ranging from cheaply made touchpads to plastic cases. At first glance, though, the Lenovo IdeaPad U400 readily ignores this assumption. With its matte aluminum casing and sharp aesthetics, the IdeaPad U400 touts a high-end look despite its price tag. Varying iterations of the U400 cost between $899 USD and $1,299 USD depending on configuration, But does this IdeaPad have a similar level of quality underneath the hood? Read on to find out. Lenovo has gone with an entirely aluminum-based case. The U400's underside features no easily accessible screws. On the keyboard deck, few extra buttons are included. 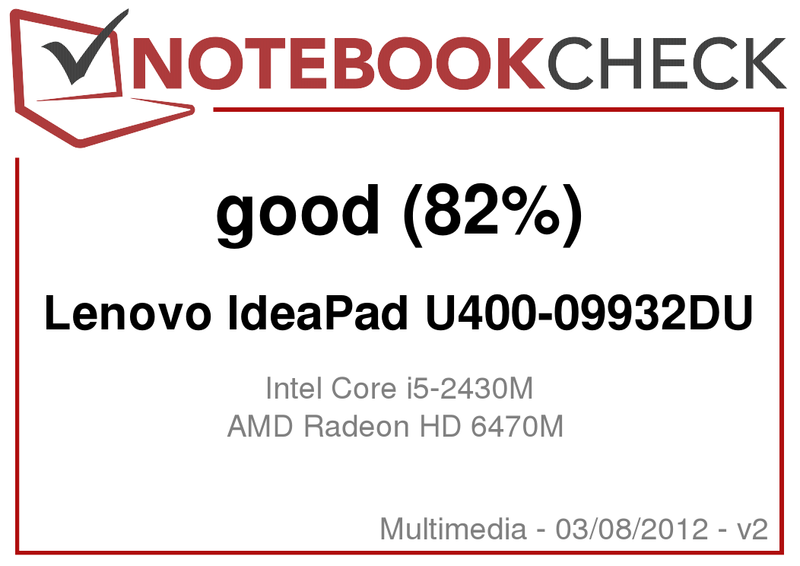 We see a lot of mainstream laptops for review, but the IdeaPad U400 is easily one of the nicest looking notebooks that has come through in a while. The U400’s case is built entirely from aluminum -- having an all-metal body provides some obvious benefits when it comes to durability, and its sturdy construction shows few signs that shortcuts were taken. There’s no flex in the body and unlike many other consumer-targeted notebooks, the U400’s build quality is virtually flawless -- we saw no signs of construction errors such as sticky touch pads or misaligned casing gaps. On every possible surface of the U400 — including the keyboard deck, monitor hinges, and display lid — we had no issues with parts feeling loose or flexing significantly. In addition, the U400’s display eschews the usual rubber stoppers for a discrete rubber ring around the screen’s perimeter. 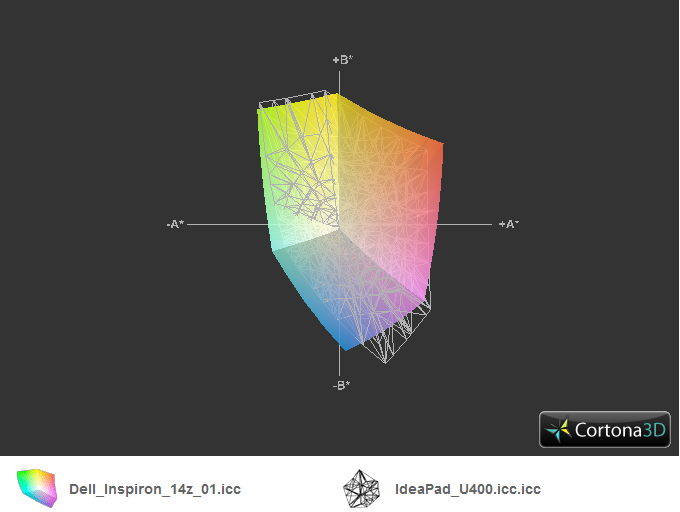 Aesthetically, the IdeaPad U400 even calls to mind laptops such as the Apple MacBook Pro or HP’s Envy series. With its rounded corners and svelte edges, the laptop’s industrial chic brushed metal look gives it an elegance that is refined without being overbearing. We’re also major fans of the minimalistic approach that Lenovo has taken with on-case buttons and LED status notifications on the U400 -- the keyboard deck only has a power button, while the front portion of the notebook body has two lights to indicate power and battery status. Users accustomed to having handfuls of backlit function buttons might miss the extra degree of control they would normally offer, but we readily prefer the reduced amount of physical clutter. This high-end detail also carries over to the laptop’s other physical aspects. For instance, the U400’s power adapter shows a similar level of attention -- it looks like a standard 3G or 4G wireless hotspot but only marginally thicker. As an AC adapter, it also looks much sharper than the typical giant, black power brick that accompanies many consumer laptops. We’ll concede that these are ultimately minor details, but in a price bracket where internal specifications are largely identical, the smaller details help to separate the best laptops from those that are merely okay. At 1.98 kgs (4.6 lbs), the U400 falls right into the middle of the pack when compared to other similarly built 14-inch, Core i5-based notebooks. For instance, the Dell Inspiron 14z clocks in at 2.05 kgs (4.5 lbs), while the Samsung Series 7 700Z3A-S03DE is a comparable 1.95 kgs (4.3 lbs). The bottom of the case offers little of note. 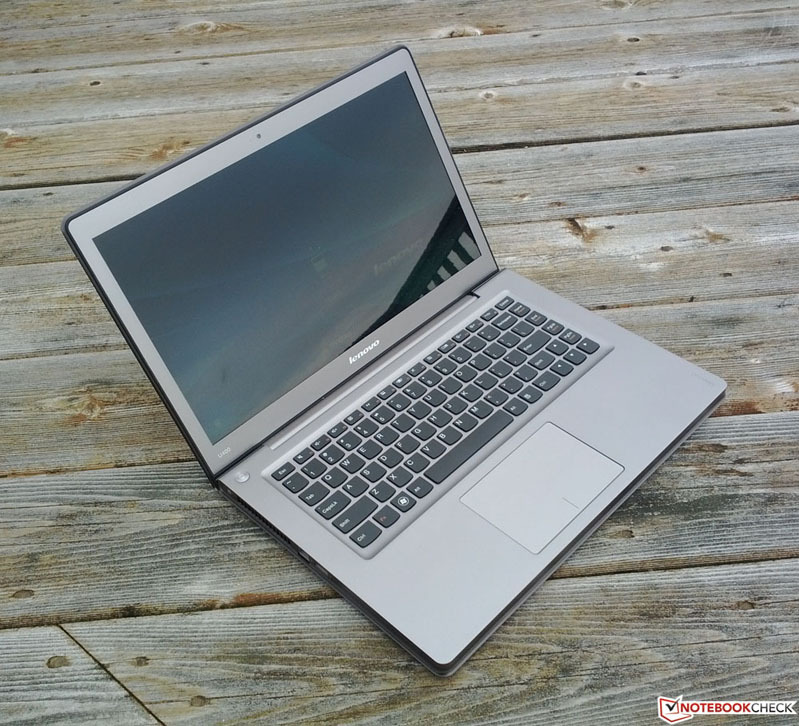 As most of the U400’s cooling needs are served by a side fan grille and a ventilating keyboard -- air is circulated through the keyboard to cool off the notebook’s internal components -- the bottom doesn’t feature any secondary fans or grilles. In addition, there are no rear protrusions from the battery since the battery fits within the dimensions of the U400. 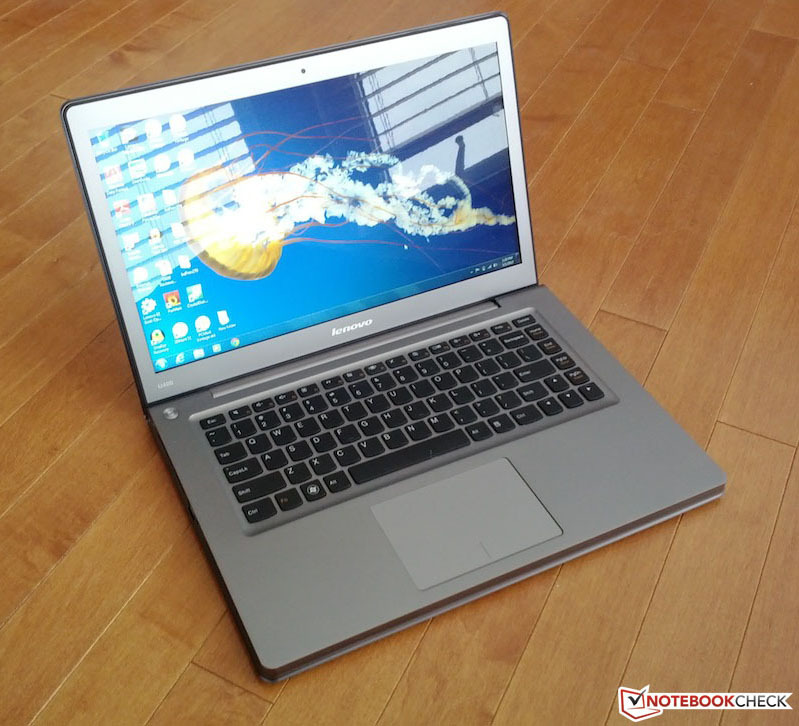 However, the U400 throws up some significant roadblocks for users who enjoy upgrading their own notebooks. 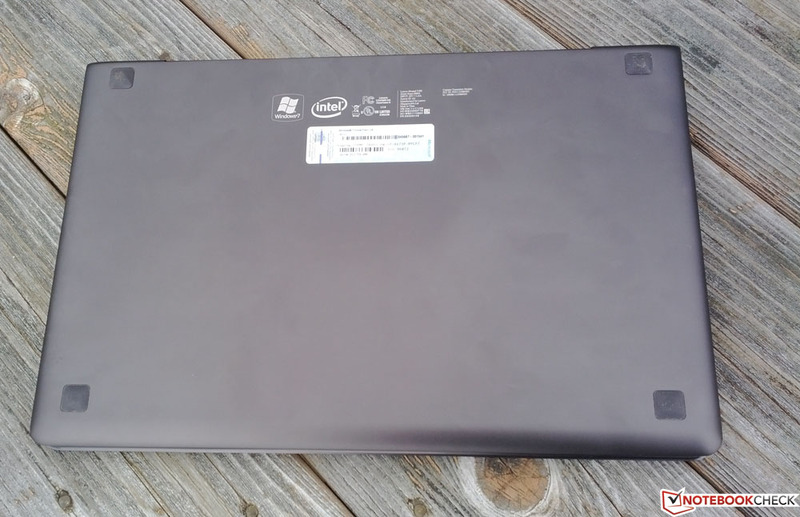 The laptop’s only screws are hidden underneath the glued rubber pads on the U400’s underside and according to several users on Lenovo’s forums, it is extremely difficult to reassemble the U400 afterwards. We’re sure that enterprising U400 owners are already figuring out ways to disassemble and reassemble the notebook, but for layman users who simply want to upgrade their own hard drive or add more RAM, it is definitely disappointing that upgrading has been made into such a difficult task. The U400’s approach towards available ports is similarly minimalistic, but whether or not this could also be considered stingy would likely depend on your usage patterns. The notebook touts a basic connectivity selection, including a single USB 3.0 port, a slot-loading DVD drive, HDMI support, and an integrated button for Lenovo’s OneKey Recovery — a bundled program for system backup and recovery maintenance. Ample space between ports makes tangled cables a non-issue and we saw no problems when testing out the U400’s HDMI port. However, you’re not going to get much more than that from the U400 as port selection is still relatively bare bones. We would’ve liked to see more relatively popular ports take up the ample amount of empty space, such as an SD card slot or a Kensington lock. The powers supply is extremely compact. As expected, the U400 features the usual networking options. Besides the RJ-45 port on the left side of the notebook, the U400 also touts support for Bluetooth and 802.11 b/g/n connectivity. However, no other connectivity options are available or supported through Lenovo. In addition, the U400 also features support for Intel Wireless Display, which allows for media streaming to WiDi-compatible hardware. We weren’t able to test this out, but users with compatible HDTVs will likely find it to be an added benefit. 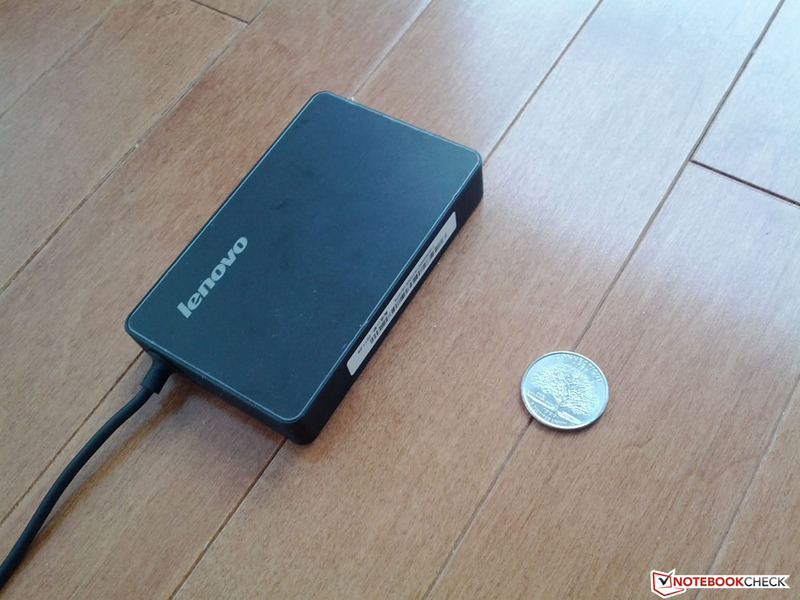 Lenovo doesn’t include much beyond the basics for the U400 — outside of the actual laptop, the only other bundled items are the power adapter and minimal documentation. 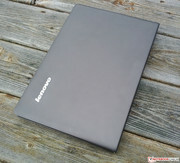 Lenovo’s site also includes various U400-specific accessories, including carrying sleeves and external keyboards. 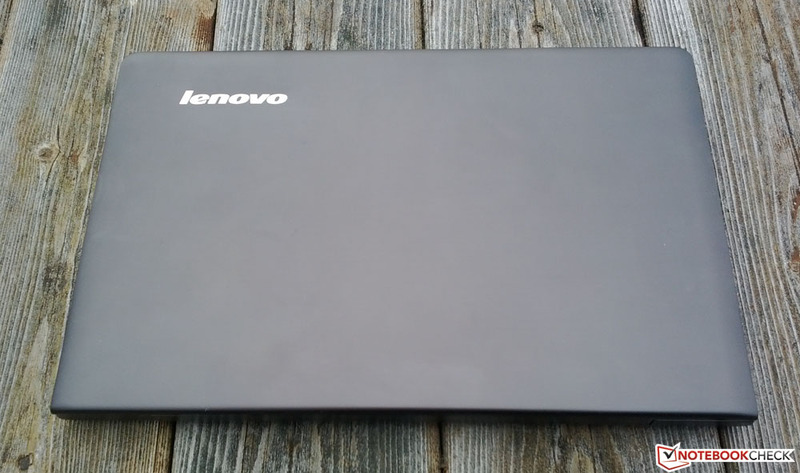 In addition, Lenovo does not sell replacement batteries for the U400 — considering the notebook’s screwless bottom, this hardly comes as a surprise, but it’s still mildly disappointing for users who want more than stock hardware. The U400 also comes with a built-in 1.3 megapixel camera, which performs as expected — it works fine for Skype and similar applications, but the quality is strictly average. In variable brightness situations, the camera struggles, so we'd make sure to be near a light when videoconferencing. By default, Lenovo includes a one-year warranty on the U400, which covers access to phone support and repair. Extended warranty coverage can also be purchased through Lenovo, which adds additional repair protection options. Surprisingly and thankfully, the U400 features little in the way of unnecessary bloatware. Beyond the previously mentioned OneKey Recovery, Lenovo has also included a trial of Microsoft Office 2010 and a small suite of CyberLink programs on the U400, among other programs. In particular, the CyberLink suite, which includes Power2Go (for DVD burning) and PowerDVD (for DVD playback), is something regular users could likely get lots of usage from. Four-finger scrolling also enables a notepad or wallpaper selection overlay that works similarly to the Dashboard in Mac OS X. It is smooth enough to operate and easy enough to access that we could easily imagine using the app for tasks such as quick notetaking. The U400 includes the expected keyboard functionality normally found on a notebook this size, such as multi-use function keys and integrated display controls. Tactile feedback is satisfactory, but we would have liked to have had the Home, End, Page Up, and Page Down keys moved elsewhere, though. Since the Home key — instead of the Backspace key — occupies the far right-hand side of the keyboard, we’d frequently hit Home instead of Backspace when we wanted to delete a character while typing, and it quickly becomes an annoyance. Over time, though, users can likely get used to this compressed keyboard format. When typing, we had to arch our wrists to an uncomfortable degree in order to type without accidentally pressing the touchpad and moving our cursor to another part of the window, although users can disable the touchpad with a function key combination. The full suite of multitouch gestures — pinch-zoom, scrolling, etc. — are also included and we do appreciate that they aren’t restricted to a certain section of the touchpad. For instance, users who want to scroll on a page won’t be locked into only using the right-hand side of the pad. 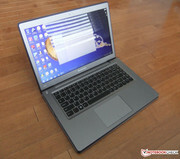 At the same time, though, we found gestures to be a bit sensitive and jumpy after coming from a MacBook Pro. The touchpad’s Cypress-based drivers provide assorted sliders to customize the touchpad, but we would have preferred for the touchpad to be better calibrated right out of the box. At 1366 x 768 pixels, the U400’s 14-inch display doesn’t offer much out of the expected, though we weren’t especially impressed with the notebook’s brightness or color spectrum coverage. As our brightness performance shows, the right-hand portion of the screen recorded a significant drop in brightness when compared to the center and left-hand quadrants. This can be problematic, as a notebook's display brightness should ideally remain relatively consistent throughout all nine quadrants. 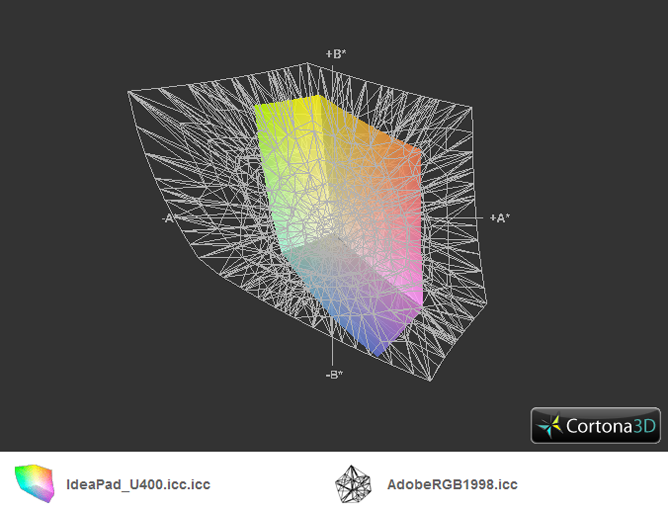 For instance, the Dell Inspiron 14z and U400 have comparable average brightnesses (203.9 cd/m² versus 200.1 cd/m²), but the Lenovo dips down to around 160 cd/m² in the lower right-hand corner of the display. 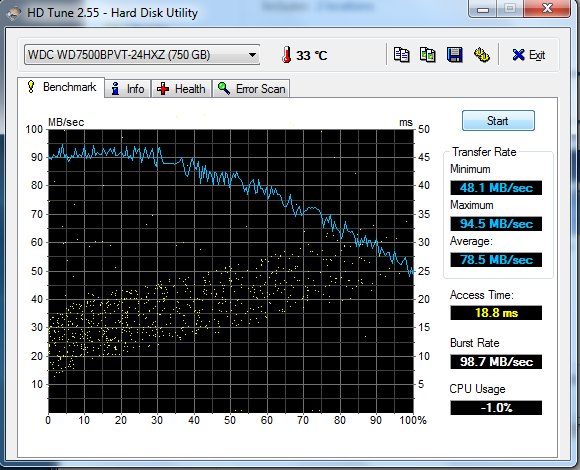 By comparison, the Inspiron 14z's lowest quadrant clocks in at 184.6 cd/m². 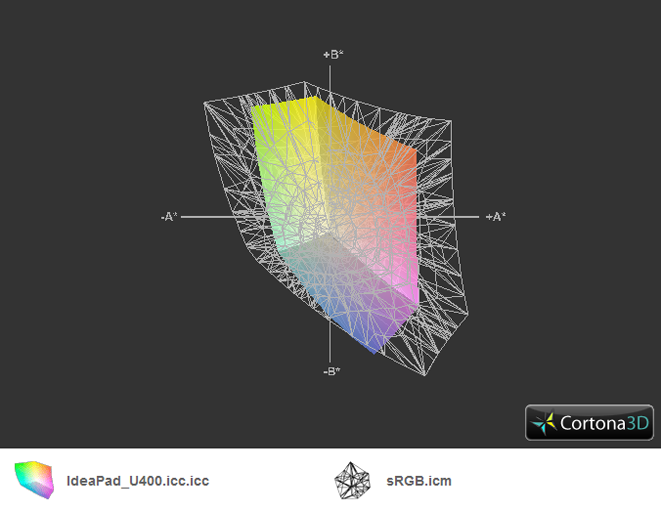 Similarly, color reproduction is average, but most casual users will likely find the display performance of the U400 to be adequate. 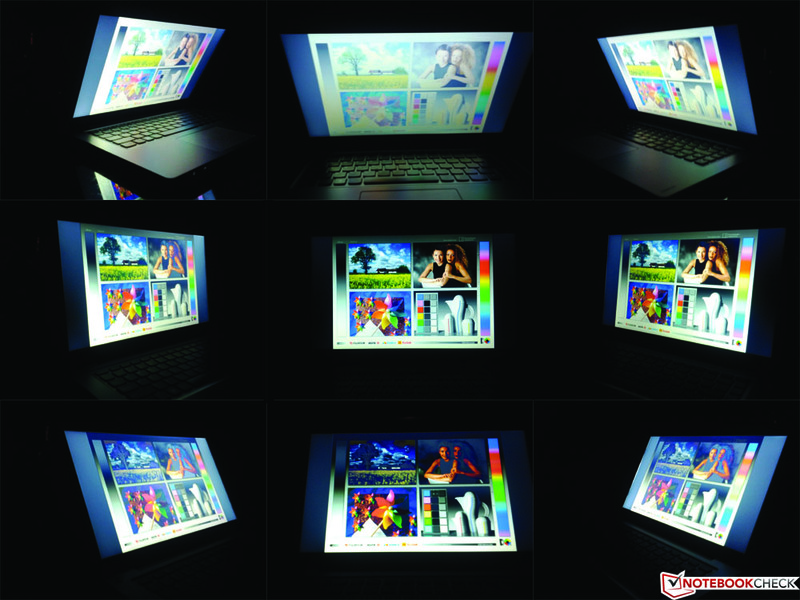 Against indirect sunlight, the U400's glossy screen performs average. In direct sunlight, the screen's reflectiveness can make visibility difficult. Viewing angles and daylight performance are also of little surprise. Extreme viewing angles and direct sunlight, for example, result in visual distortion and visibility issues, respectively. The glossy screen, however, does perform respectably well when under indirect sunlight. 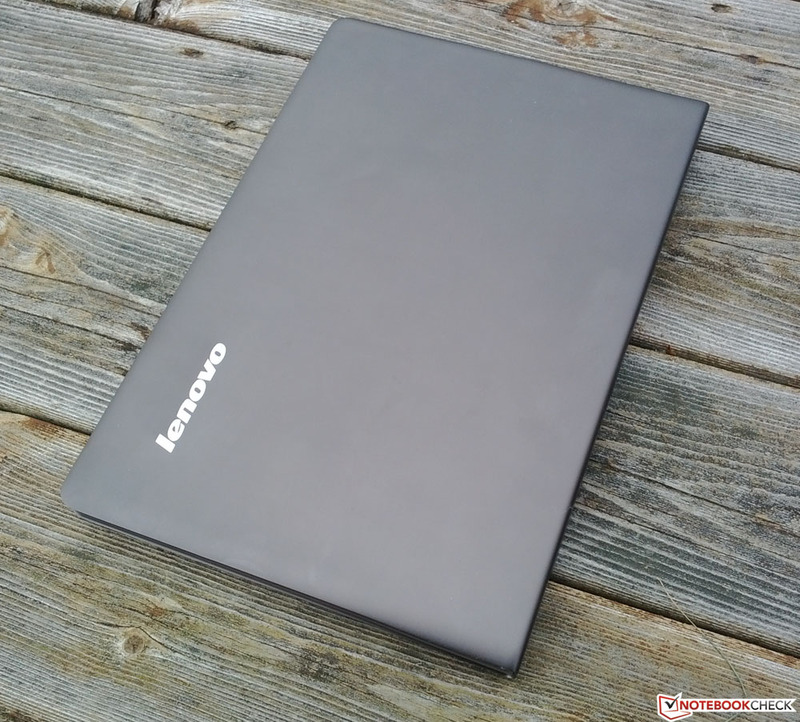 The U400’s relatively locked-down case makes third-party upgrades a bit of a pain, but at the very least, Lenovo offers multiple configurations for potential buyers. In addition to Core i3, Core i5 and Core i7-based models, all versions of the U400 sport an AMD Radeon HD 6470M GPU. Storage options go from 500GB to 750GB. The U400 does provide respectable performance against similarly built competitors, though. Our review unit touted a 2.4 GHz Core i5-2430M, 6GB of DDR3 memory, and a 750GB WDC WD75000BPVT-24HXZT3. Within PCMark 7, the U400’s score (2261 points) was largely equal to competing Core i5-2430M based laptops such as the Dell Inspiron 14z (2271 points) and the Samsung Series 7 700Z3A-S03DE (2308 points). In Cinebench 10.5 and Cinebench 11, the U400’s performance told a similar story. In the latter synthetic benchmark, the IdeaPad's performance was virtually identical to other Core i5-2430M based laptops in the rendering and CPU tests. With all three Cinebench 10 tests, the U400 also performed similarly, coming within a roughly 100-point difference to other Core i5-2430M based systems. HD Tune performance was average. With HD Tune and CrystalDiskMark 3.0, our U400’s use of a standard SATA drive didn’t provide much in the way of exceptional performance. Access speeds and performance were virtually identical in both tests when compared to competitors such as the Dell Inspiron 14z. DPC Latency Checker performance was similarly average — we saw few unexpected peaks or jumps. In addition, the U400 showed no signs of performance throttling when we ran HWiNFO in conjunction with Prime95 and Furmark for an hour. Both the GPU and Core i5-2430M CPU ran at their advertised maximum speeds. Thanks to the U400’s AMD Radeon HD 6470M GPU, the U400’s 3DMark performance was notable, though it faltered in higher-end situations. The IdeaPad’s 3DMark 06 score (4502 points) was almost the same as similarly built laptops such as the Sony Vaio VPC-CA1SE (4533 points) and Samsung Series 7 700Z3A-S03DE (4498 points). In 3DMark Vantage, the U400 (1940 points) also fell in line with AMD Radeon HD 6470M-based laptops such as the Sony Vaio VPC-SB2L1E/W (1930 points) and the Sony Vaio VPC-SB1Z9EB (1980 points). Within 3DMark 11, however, the U400’s AMD Radeon HD 6470M GPU did hold it back as its score of 594 points was among the lower end of the spectrum for HD 6470M-based laptops. Considering the HD 6470M’s entry-level specifications, the U400 will likely be placed out of contention for most high-end gaming graphics applications. In addition, after running an additional graphics stress test — 3DMark 06 scores were taken before and after running Furmark and Prime95 in unison for an hour — we saw no significant signs of GPU throttling. Final scores were within a statistically insignificant difference from one another, which indicates that performance will likely stay consistent while under load. Thanks to the U400’s single fan grille and ventilated keyboard, the notebook doesn’t produce much in the way of noise. During our testing, the U400 idled near 30 decibels while idling or running, and only peaked at a relatively quiet 39 decibels when it was under load. When we played a DVD through the U400 with speakers on moderate volume, the drive noise was barely noticeable. Still, the humbled approach towards insulating sound or temperature likely plays a role in the U400’s average heat dispersion abilities. As with all of our reviewed laptops, we ran the IdeaPad through an hour-long stress test where Prime95 and Furmark were active simultaneously. Prior to and after the test, we took temperature measurements of the laptop’s keyboard deck and underside. During our heat test, temperatures on the U400 never reached an uncomfortable level, but the jump in degrees was a bit surprising. On the upper left-hand corner of the keyboard deck, for instance, the entire region saw a jump of 10 degrees Celsius following the load test. But, the notebook never became uncomfortably warm to use. (+) The maximum temperature on the upper side is 37.2 °C / 99 F, compared to the average of 36.5 °C / 98 F, ranging from 21.1 to 71 °C for the class Multimedia. The U400 touts two stereo speakers equipped with SRS Premium Surround Sound, though as with most consumer notebooks, it’s nothing to write home about. We ran songs such as The White Stripes’ “Seven Nation Army” and The Black Keys’ “Lonely Boy” through the speakers and found the resulting sound quality to be tinny and lacking in low-end fidelity. For consumers used to notebook-quality speakers, though, the U400’s audio performance is hardly a surprise, but external solutions are still recommended for extended periods of use. At 54Wh, the U400’s battery is slightly undersized when compared to several of its competitors. 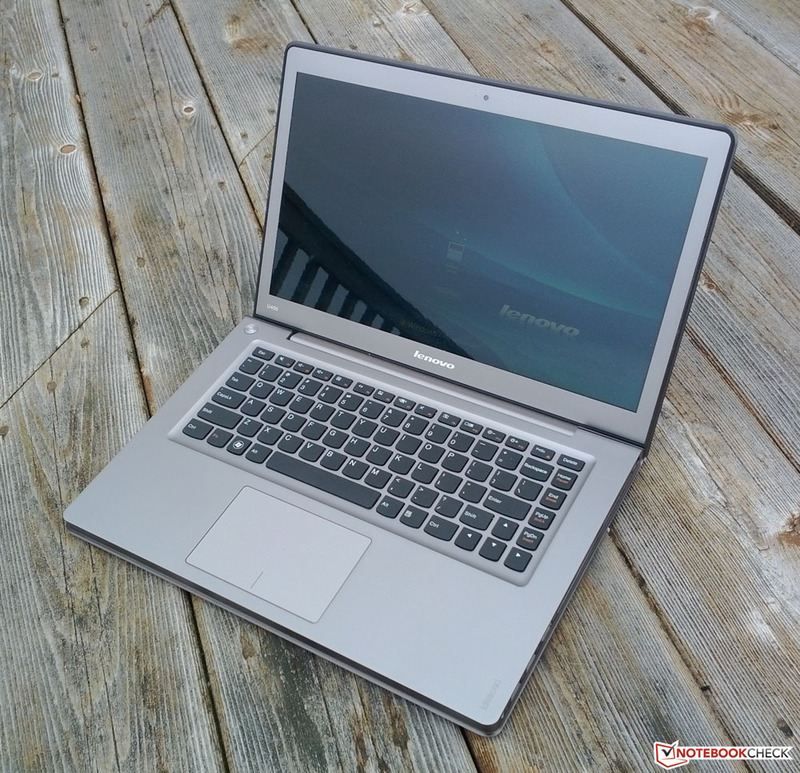 For instance, the Dell Inspiron 14z and Samsung 700Z3A-S03DE both tout a 65 Wh battery, though the Samsung does sport a slightly higher pricetag. The U400’s battery suffers in comparison, though it still manages to perform as expected. All four tests were done within BatteryEater and measured different usage situations for the U400. When idled with WLAN disabled and brightness set to a minimum, the U400 lasted for 6 hours and 40 minutes — within throwing distance of Lenovo’s rated time of up to 7 hours. General-use testing (measured with a combination of web browsing and using non-intensive applications) managed to eke out around 4 hours of battery life from the IdeaPad, but the notebook barely lasted more than an hour under load. Here, Lenovo’s choice to go with a closed system seems a bit questionable. The U400’s performance certainly performs as expected for a 14-inch consumer notebook, but when laptops such as the Dell Inspiron 14z and Samsung 700Z3A-S03DE can include larger capacity batteries without adding much additional weight, it can’t help but feel like a missed opportunity for Lenovo. 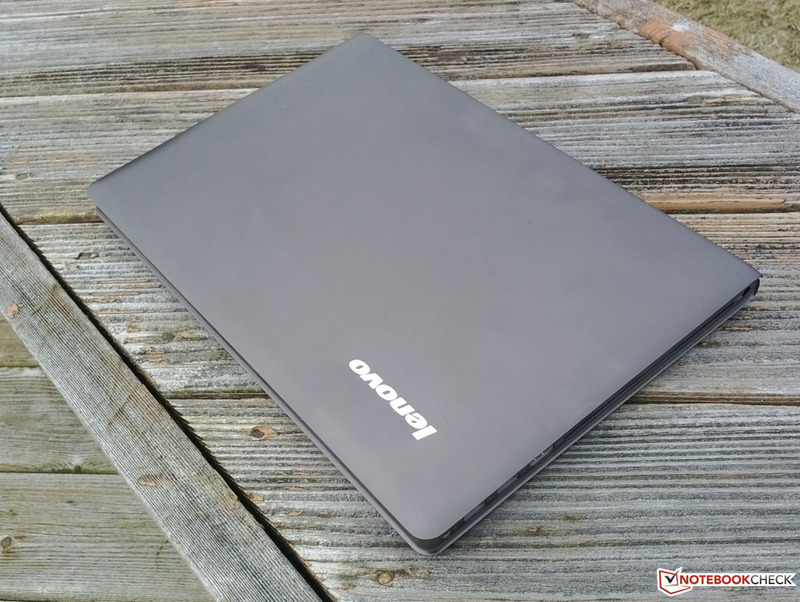 When it comes to midrange notebooks, the Lenovo IdeaPad U400 poses a straightforward question: do you want a notebook that looks good or one that has exceptional performance and upgradeability? 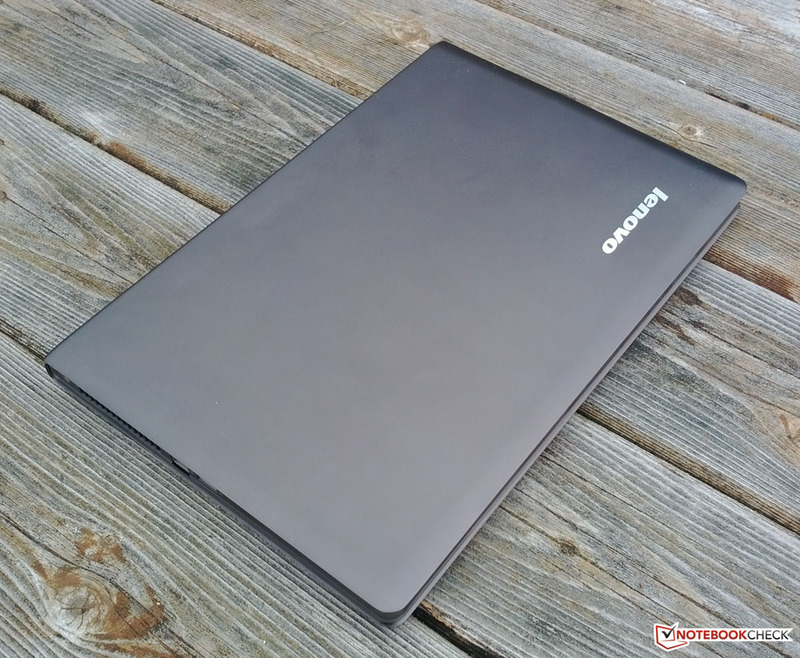 Aesthetically, the U400 is one of the best-looking notebooks we’ve seen at this price tier with good CPU performance. But its overall performance is — in every sense of the word — average. 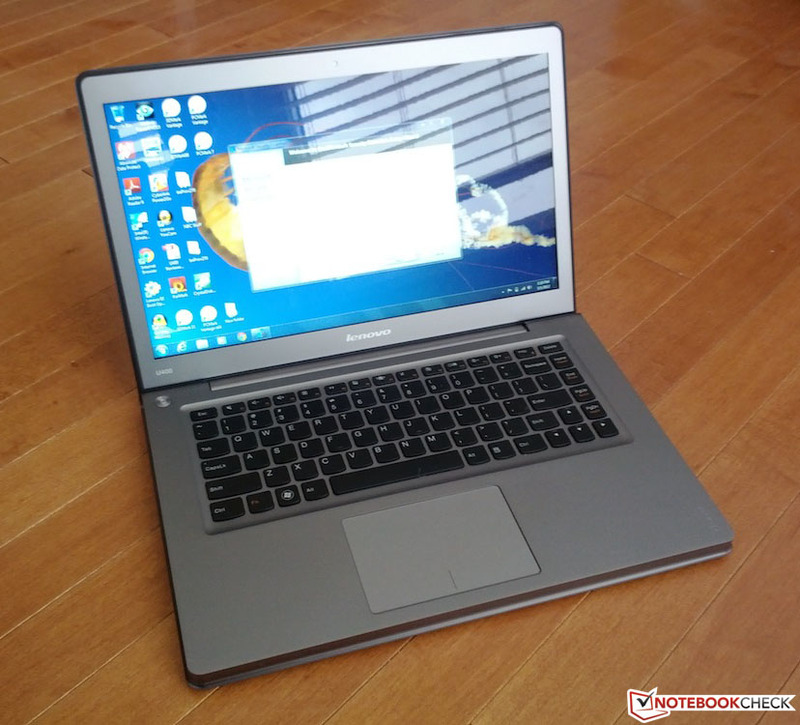 The notebook certainly doesn’t perform poorly when compared to other similarly built Core i5-based notebooks, but with a few exceptions, it’s neither impressive nor terrible. The U400's battery life, weight, size and display are all overwhelmingly unremarkable. Users who simply need a utility notebook will likely be satisfied from the IdeaPad U400, but limited upgradeability and mid-level performance make it a harder sell for non-casual applications. The case features a minimal number of backlit notifications. Better performance and port selection. An AC adapter that didn't look clunky, and an all-aluminum exterior at this price point.